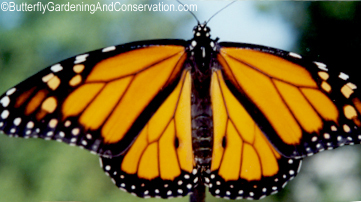 Monarch butterflies are a well known and easily recognized butterfly. Every year they fly south to Mexico to spend the winter there. In the spring they fly back to North America for the summer. Five or so generations of Monarchs live in N. America during the summer, ending with the last generation of adults flying south to Mexico to start the cycle all over again. 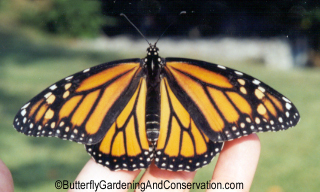 In general Monarchs are a pretty hardy species and easy to attract to a butterfly garden. The host plant used by Monarchs is milkweed. There are many different species of milkweed, Monarchs tend to like some better than others. The two I would most recommend are Swamp Milkweed (Asclepias incarnata) and Tropical Milkweed (Asclepias curassavica). As its name suggests, Tropical Milkweed is not native to the cooler regions of the US, and can only be grown as an annual. 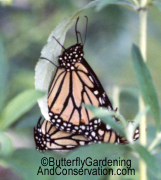 Monarchs like both of these plants very much, both for laying eggs and as a nectar source. Most typical nurseries, if they sell any milkweed at all, tend to only sell Butterfly Weed (Asclepias tuberosa). Butterfly Weed is native to most of the US, but is not as preferred as a host plant as much as the two mentioned above. It is still a nice native plant to grow however, and they will likely lay some eggs on it too. 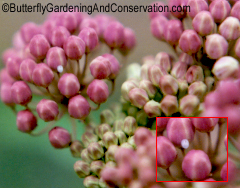 Female Monarchs lay eggs singly on the underside of milkweed leaves and on the flower buds. They are about 1mm in width and a white/cream like color. Like most other butterflies, the egg turns darker when it is close to hatching. 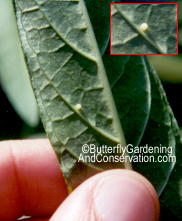 Monarch egg on underside of milkweed leaf. Red box shows zoomed in picture of egg. Monarch egg on Swamp Milkweed flower bud. Red box shows zoomed in picture of egg. it is what is left of its egg. 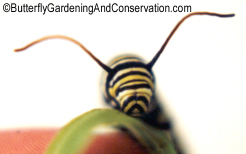 When a Monarch caterpillar first hatches from its egg it is a light greenish color with a black head. Like other butterflies, after hatching, it eats the rest of its egg. They are about 2-3 mm in length right after hatching. Eventually stripes/bands start showing on the caterpillar. 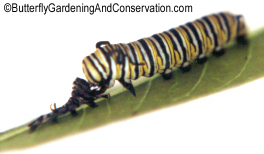 Monarch caterpillars do not change their appearance very much as they grow. They have two long black filaments by their head and two towards the end of their body. They look like antennae, but they're not, I usually refer to them as 'fake antennae'. The 'fake antennae' by their heads are longer than the other two. 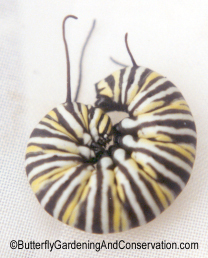 At each instar the 'fake antennae' are longer also. These two are early instars, possibly 2nd instar. The one on the right has just molted and its dead skin can be seen laying behind it. Notice the yellow, black and white stripes are starting to show and its 'fake antennae' are just two little stubs by its head. These two are either 3rd or 4th instar. Notice how much they have grown - the ruler next to them shows their length in millimeters. 5th instar Monarch caterpillar, right after molting. It is in the process of eating its old skin. Notice how its 'fake antennae' are still all crumpled up. 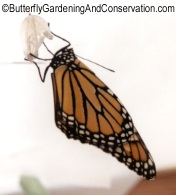 Like other caterpillars, Monarchs eat their old skin after it comes off when they molt. 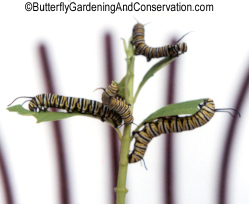 Monarch caterpillars grow to about 4 cm or so before they are ready to pupate. 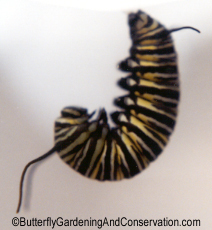 When Monarch caterpillars get scared they drop to the ground and curl up in a ball to play dead. Nearly full grown Monarch caterpillar. Monarch caterpillar curled up and 'playing dead'. Front view, showing its face/head capsule. 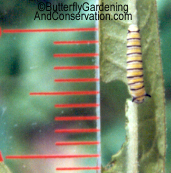 Monarch caterpillars can eat a lot! These 4 have nearly eaten all of this plant. what is called a 'J-shape'. After finding a place to pupate and forming a 'J-shape' they molt once last time, to form their chrysalis. The yellowish looking spots on the chrysalis are actually a metallic gold color and are very pretty, but can't be seen well in pictures. Monarch chrysalis from the front. 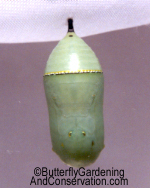 Monarch chrysalis from the side. This one has just emerged from its chrysalis - it wings are still all kind of crumpled up. This one is not ready to fly yet and is still hanging upside down. You can see the empty chysalis by its feet. 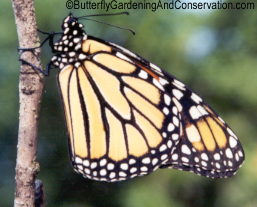 Male Monarchs have two black spots on their lower wings, females do not have these. Also, the black lines separating the orange areas are thicker in females, than in males. Compare the picture of the female at the top of this page, to the male to the right to see the difference. 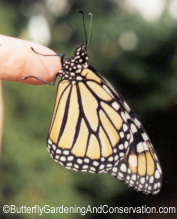 Monarchs with their wings closed, from the side. I got these two pictures of Monarchs mating this past summer.